Only this time, its appetite is insatiable. Incredibly rich and atmospheric, this blending of myth, folklore and suspense is the literary equivalent of a symphony. The writing, language and tone of The Glass Casket stand on their own, but the combination of elements is what really blew me away. What's even better is that it's impossible for me to label this novel with a genre or style because it weaves together components from across the fictional spectrum. In a quiet village outside of time, people are dying and no one knows why. First, a group of soldiers are found dead on a remote mountain top. One man is mauled, but the others haven't a mark on them. It has to be an animal, but Tom can't force himself to believe that, even after seeing the bodies. Rowan dreams of a life beyond Nag's End and the sometimes strange beliefs of the mountain people. However, new arrivals in town, a family secret, and changes in her lovestruck best friend Tom's behavior draw her into the search for whatever is behind the killings. As more people turn up dead, the possibility of monsters becomes frighteningly real. I didn't know much about this novel when I first picked it up except that the cover and blurb promised something dark and potentially creepy. The Glass Casket sets up a little more like a dark fantasy than a true horror story at first, which gave me pause, but McCormick Templeman surprised me. Templeman spins a tale of suspense, murder, and dark love in the vein of the great gothic tales, sensual and at times terrifying. The Glass Casket is not only a well-paced, solidly plotted novel, but a rare example of love disturbing in its ferocity, yet utterly undeniable. The most simultaneously confounding and amazing thing about this novel is the undefined yet somehow crystal clear sense of place and time. There is a distinct village with consistent customs, yet no location. Similarly, it's apparent that this novel isn't set in our present, but pinning it to a specific period is nearly impossible. Turns of phrase like Tom's mother referring to what other than an animal could have "laid those men so low" while discussing the first killing, and the constant donning of cloaks gives the impression of olden times. References to goddesses also evoke images of ancient pagan cultures. In contradiction, burying the dead in a "cimetiere" is referred to more than once as a practice of the ancients and no longer the way of Tom and Rowan's people. Templeman engaged me in the world, fascinating me with the differences from our own, without pulling me out of the story and making me feel like I needed to do research to understand. 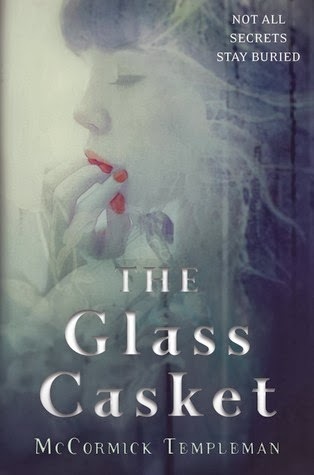 All I can say is that if you're a fan of fairytales (particularly the dark originals), mythology, fantasy, mystery or suspense or any combination of those things, then you should be reading The Glass Casket right now.